Learn some sweet facts about caramel! Caramel is a delicious treat that is enjoyed by people all around the world. There are tons of people who love the taste of caramel, but there are several facts many people don’t know about it. Caramel is a delicious, versatile food that has a fascinating history. Here are some sweet caramel facts you should know. Like chocolate, caramel has its own national holiday! According to the National Confectioners Association, October is National Caramel Month. You can enjoy this month by ordering some of our delicious caramel offerings. Our milk chocolate caramel hearts and our classic caramel popcorn are perfect treats to enjoy during this month. You may have noticed that caramel is included in a lot of foods, but you may not be sure about how it’s made. It may seem like you’d have to be a confectioner to know how to make it, but the main ingredients in caramel are surprisingly simple: milk, sugar, and butter. This means that you can even make homemade caramel! Caramel dates back to the 17th century, making it a longstanding staple in the world of sweets! Early Americans used to make caramel using sugar and boiling water. It was an especially popular treat because it was easy to make, affordable, and delicious. Some things never change! When you think about caramel treats, the first thing that might come to mind is a caramel apple. This tasty creation is a staple for many people during the fall months. But did you know that its invention was an accident? 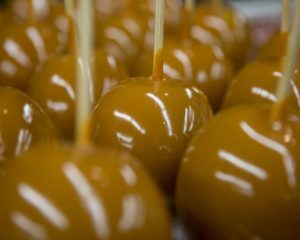 In the 1950s, Dan Walker, a sales representative at Kraft Foods, dipped apples into some caramel he melted down. They were a hit, and still recreated today. The next time you’re enjoying a caramel apple remember to thank Dan Walker! TASTY CARAMELS AT WOCKENFUSS CANDIES! This entry was posted on Friday, February 1st, 2019 at 3:52 pm. You can skip to the end and leave a response. Pinging is currently not allowed.